Traditional VOIP hosts offer subscription-based and persistent servers, so generally a premium is charged. 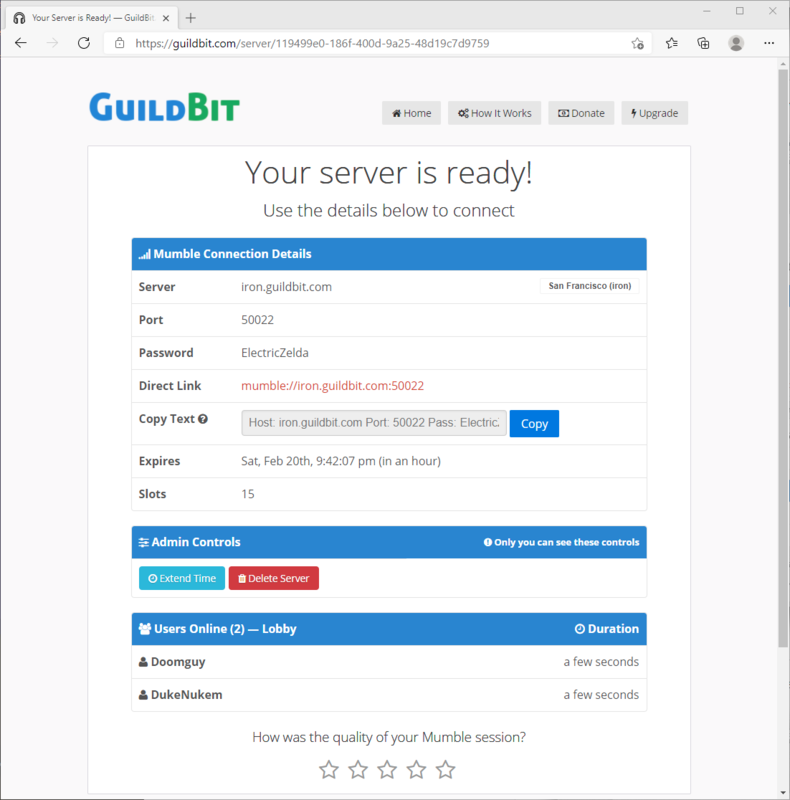 GuildBit works on the idea of temporary servers to preserve system resources, opening up more server slots which aren&apos;t being occupied. This helps lower hosting, resources and bandwidth costs. Also, VPS hosting nowadays are much cheaper than they used to be. The rest is supported by donations and upgrades. Choose a server location closest to your group to minimize latency. Password protected servers are required, due to the fact the server may be reused in the future. 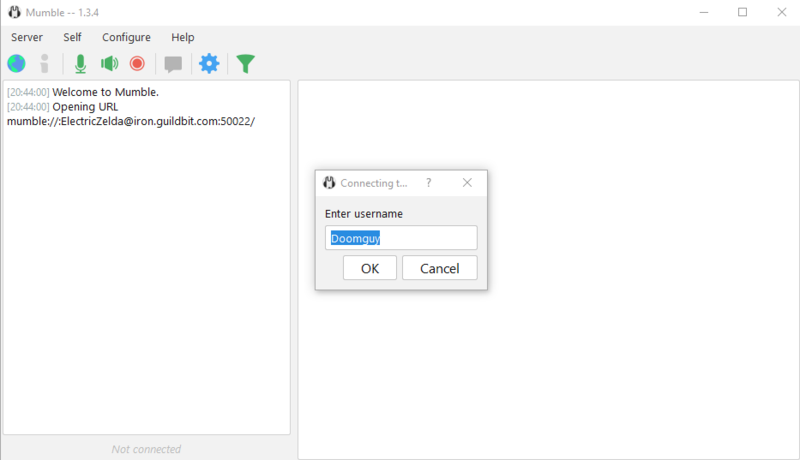 Share the connection details, or use the copy feature to copy/paste the credentials directly. 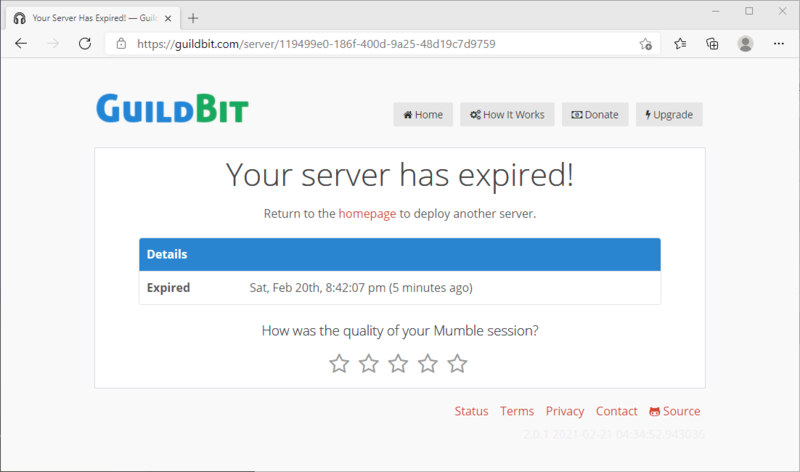 The server page also monitors users in room (including subchannels) and displays the expiration countdown. 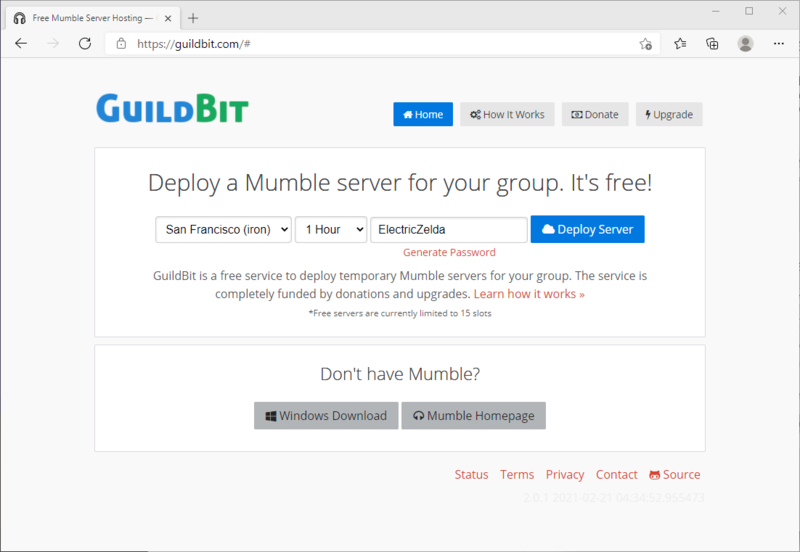 The idea is targeted towards gamers who need a quick Mumble server for their group or raid without the hassle of setting up their own, or subscribing to a service. The server expires to not only save on resources, but to free up the slot for others. Check out the upgrades page if you&apos;re looking for more than 15 slots. Why can&apos;t I use the same port when creating a server? Servers are created according to the next port available. Why only offer Mumble and not Ventrilo or TeamSpeak? 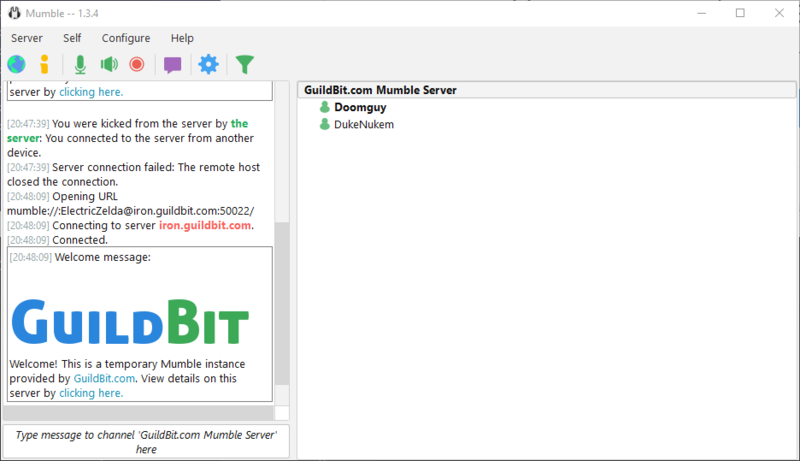 Mumble is free and open-source software. So it doesn&apos;t cost me any licensing fees to host Mumble servers or offer it as a service. Do you offer premium upgrades? Yes! 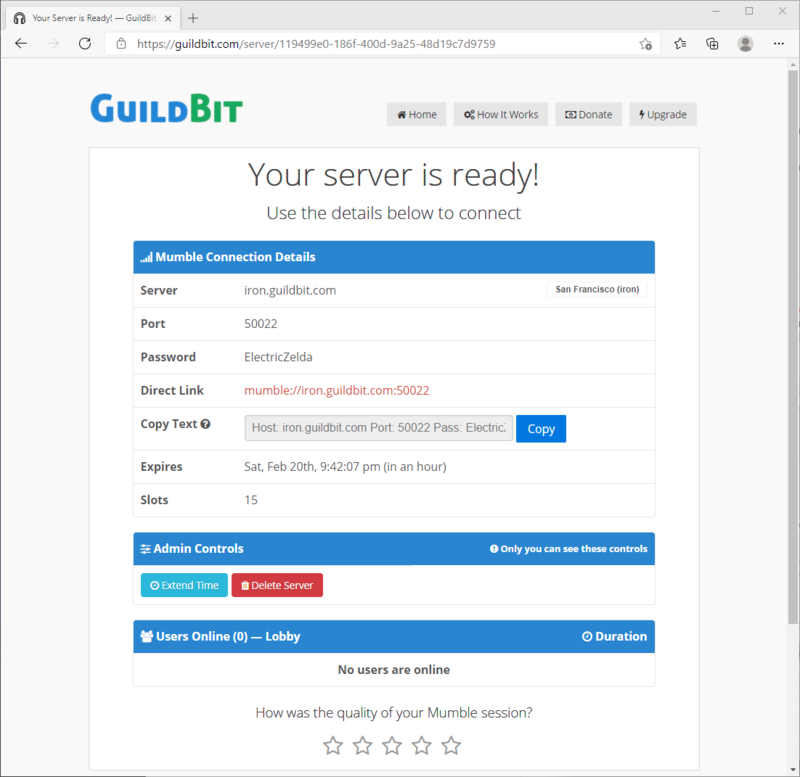 We now offer server upgrades via Bitcoin and Paypal to increase slot count, duration, subchannels and a SuperUser admin capabilities. Click here to get started. A SuperUser is an admin account on your Mumble server to grant permissions and roles to users and groups as well as setting up channels. Do you plan on offering other methods of payment? Purchase upgrades! Click here to get started. We accept donations, including Bitcoin! :) This keeps us going. Are you a developer? Check out the Murmur-REST project on Github and contribute! Help us improve or add translations. Contact us for more details! Feel free to use the contact form to report any bugs or to contact me with any questions or comments!